After a recent trip to Scotland I arrived back with lots of lovely Scottish goodies, in particular a pack of smoked venison from the Rannoch Smokery, which you can also purchase online. After the usual holiday binge and some proper summer weather at last I wanted to make a vibrant seasonal salad. OK, I confess that the pears are definitely not seasonal but they go so well with venison so I balanced this out with new season redcurrants. This is a really simple recipe and can be assembled in 15 minutes so great for a summer evening when you want to spend less time cooking and more time sipping G&T’s outside. Incidentally, I enjoyed this dish with a chilled glass of Vendanges Nocturnes Rose, which was fresh, crisp and went perfectly with the venison and tart redcurrants. 1. To make the dressing put the redcurrants, red wine vinegar and water in a saucepan and simmer for 3-4 minutes until the fruit release their juice and start to break down. Add the redcurrant mixture to a mini food processor along with a small squeeze of lemon juice and whizz until pureed. Pass the liquid through a sieve to remove the skin and seeds. This makes more than you need but chill in the fridge for further use – it would work really well with a feta salad. 2. 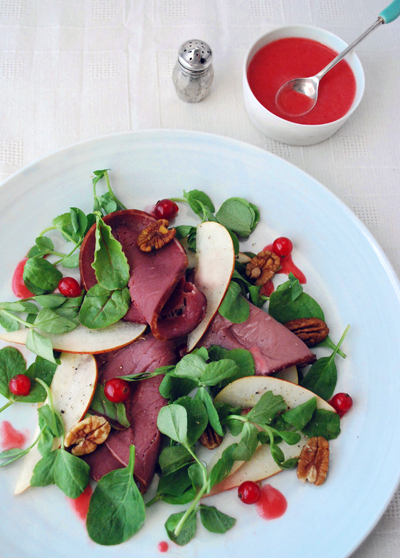 Assemble the smoked venison slices, salad leaves, thinly sliced pear and pecans on a plate and dot the redcurrant dressing over. Add a small handful of redcurrants to finish. 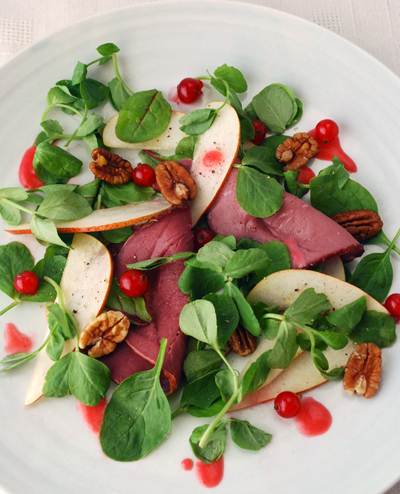 This entry was posted in Recently cooked and tagged pear, pecans, redcurrants, smoked venison, venison, venison salad on 26/07/2012 by Val McArthur.